Vladimir Putin and Rex Tillerson attended the ceremony of signing of the Rosneft-ExxonMobil strategic partnership agreement in 2011. Russia will be comfortable to deal with Rex Tillerson, whom the US President-elect has chosen to be his Secretary of State. Donald Trump has picked his Secretary of State. This key post in the US President’s Cabinet will be occupied (after approval by Congress) by Rex Tillerson, head of the world’s largest oil company ExxonMobil, recipient of the Russian Order of Friendship, and a good friend of Vladimir Putin. However, he is not pro-Russian, much like Trump himself, but a pro-American candidate – this is simply a different America. “What I like most of all about Rex Tillerson, is the fact that he has extensive experience in successful business negotiations and dealings with all types of foreign governments,” wrote Trump, while announcing that he was planning to appoint the oilman as Secretary of State. “Perseverance, extensive experience and a deep understanding of geopolitics, makes him a magnificent choice for the post of Secretary of State. He will promote regional stability and focus on the core national security interests of the United States,” said Trump. Tillerson is more than an influential figure in the United States. Although he is not the owner, but only a hired manager, heading the largest oil company and the extensive intra-elite ties make him a real heavyweight. Tillerson knows many world leaders, both public and those in the shadows, Trump noted in an interview with the Fox News Network. Tillerson has 20 years of experience in working with Russia, and has known Putin for 15. Of course, this was not the reason behind Trump’s decision. The main reason is that Tillerson has long been perceived by many prominent international figures as “a man of their circle”. Selecting Tillerson even eclipsed Trump’s decision to appoint General Flynn as his national security adviser. Flynn has called for America to cooperate with Russia on Syria, and once even sat next to Putin at a reception in Moscow. And now we have the man who has been honoured with the Russian Order of Friendship, personally presented by Putin! Not long ago, Tillerson was described as someone who “had spoken with Vladimir Putin more than any other US citizen, with the possible exception of Henry Kissinger” but that is not true. This is because the future Secretary of State has already spent more time with Putin than the former Secretary of State has. During the past decade and a half, Putin and Tillerson have met officially several times in Russia and in the United States – and probably, a certain amount of times even informally, which allows this oilman to characterize his relations with the Russian president as “very close”. The last time Tillerson visited Russia was in June this year, attending the St. Petersburg International Economic Forum – despite the sanctions and the formal guidelines issued by the US State Department. In 2014, he spoke out against the anti-Russian sanctions. This is not surprising, considering the large projects that ExxonMobil has in Russia. The company signed an agreement with Rosneft in 2011 for joint development of deposits on the Arctic shelf, and in Siberia – estimated to be worth several hundred billion dollars. 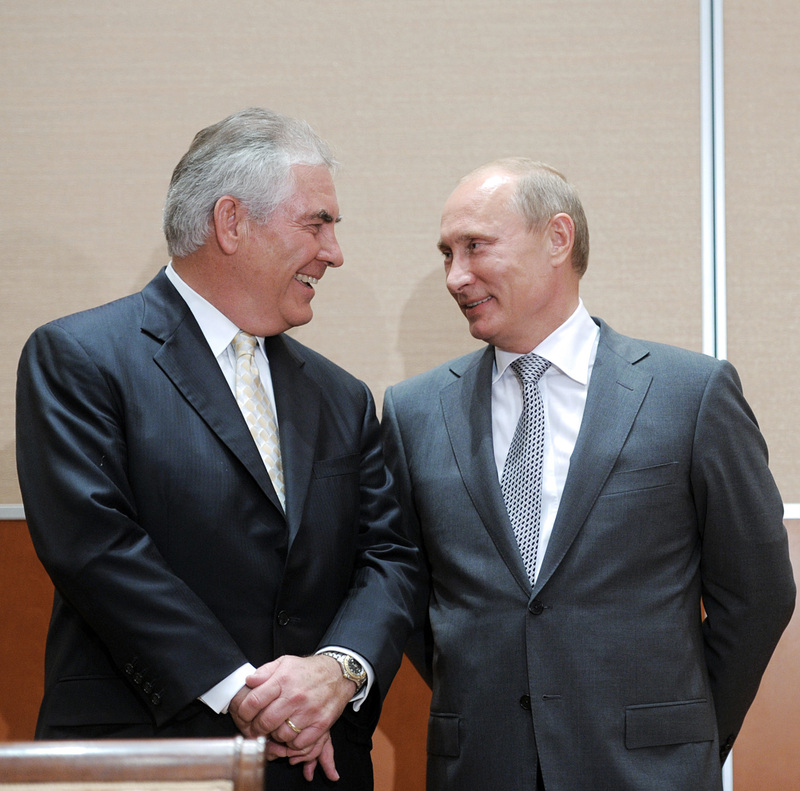 These works never got a chance to start – but both Putin and Tillerson understand that the joint development of the shelf is beneficial to both, even now, for both countries, because Tillerson will not be working for Exxon, but for a strong America, an idea he shares with Trump. Appointing Tillerson will not be an easy task. A simply decree by Trump is not enough; the candidate must be approved by the US Senate. Even though Tillerson is by no means a pro-Russian candidate, and will be tough on defending US national interests, a number of senators have already voiced their opposition to his appointment. They have criticized him especially for his “relations with Russia”. “The main topic during the approval of his candidacy will be his relationship with Putin. Tillerson and his company had opposed sanctions against Russia, he received the Order of Friendship from Putin, and he was actively engaged in the oil business mainly in Russia,” an employee of one of the Democratic senators on the US Senate Committee on Foreign Relations told Politico. Nothing else could have been expected from McCain. However, as observers have already noted, no Republican senator has said that he would vote against Tillerson – given that the Republicans have 52 seats, against the 48 the Democrats in the Senate, Trump will be able to count on the support of his party. Of course, by appointing Tillerson to the Senate, Trump is demonstrating his power, and putting in front of it an extremely unpleasant, if not impossible, choice – and this is a very strong move. In addition, Trump is demonstrating that he is truly in charge of creating his own cabinet, and choosing people with character, and not afraid to voice their views. This will be a very strong team, but the question is – how will Trump ensure that they all follow the same line and, in this case, his own line. When it comes to Tillerson, one thing is clear – when it comes to Russia, their views do coincide. Both believe that it is better to negotiate with Russia, than to be in conflict with her. And this is a very good sign. Not in the sense that we are waiting for the era of “entente cordiale” or a “strategic partnership” with the United States. Of course not – to create trusting relationships between the governments of the two countries, requires not only close contacts between their leaders, but also a common understanding of what the future world order should look like. For now, all we can say is that both Trump and Tillerson agree that they should, at minimum, try and negotiate with Russia on specific issues, whether it be on the Middle East, Ukraine or sanctions, and at maximum – discuss the parameters of the future new world order. This, of course, means great progress has been achieved. It was impossible to talk about such things with supporters of the “American exceptionalism”, which run the current US administration. The article is abridged. Read the full version in Russian published by Vzglyad.